This day in 1955 the Hunter was hit by one of the most memorable disasters in Australian history. After a period of heavy rain across a large area of the Hunter and its surrounding districts, the Hunter River swelled to record heights and flooded the valley. 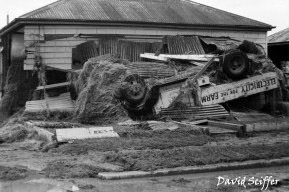 The Hunter floods of 1955 are placed in history with Cyclone Tracy, Granville, Newcastle Earthquake and the 1939 bushfires as being an infamous disaster of the 20th century. Unlike many previous disasters, the flood was captured with a variety of media like motion pictures and still photography. The images of the main streets of Maitland shook the nation. A total of 25 lives were lost in the floods, majority of these lives were taken in Maitland and Singleton. The 1954 – 1955 was dominated by a La Niña (opposite to the El Niño) event. 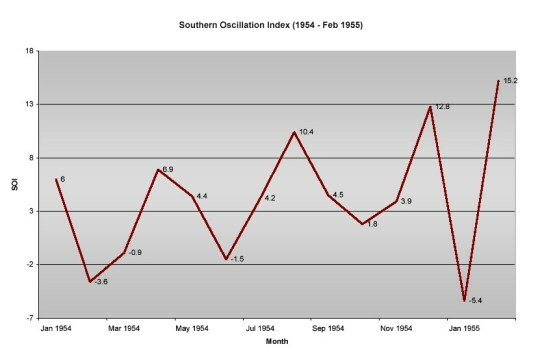 The Southern Oscillation Index (SOI) leading to February 1955 was in the positive for nearly 8 months, peaking at 15.2 by the end of February 1955. The winter of 1954 was very mild. August 1954 still stands at as being one of the warmest August in history. Monthly rainfall totals from October 1954 to February 1955 were above average across a large area of the Hunter. Many locations received there highest rainfall totals on recorded. 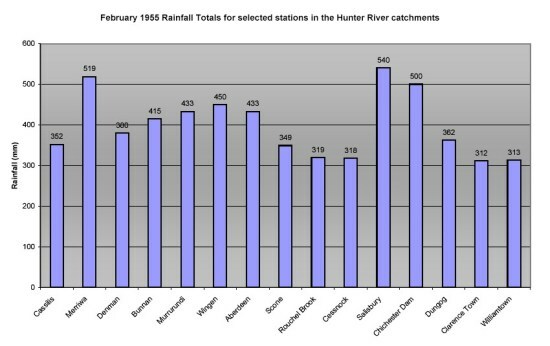 Most stations within the Hunter River catchments recorded more then 300mm for February 1955. Merriwa and the surrounding districts recorded more then 450mm for the month, which is approximately 150mm below its average yearly rainfall. Because of the wet and humid conditions, the summer of 1954/1955 was generally mild. The monsoons in the tropical regions of the continent were very active with tropical cyclones occurring more frequently then normal. Active monsoons during a La Nina is a normal phenomena. February 1955 was also wet in a large area of southeast Australia. Goulburn Valley in Victoria flooded after record breaking rains fell in a large area of eastern Victoria between 10 – 15th. A tropical low developed over central Queensland near Longreach. This system developed from tropical activity and moisture was fed into the system by a trough line that extended into the Gulf of Carpentaria. Meanwhile, a low pressure trough extended down from the Coral Sea to eastern New South Wales. By the 22nd, both systems converge to form a separate low pressure cell over the northern parts of New South Wales. It was this secondary low that caused the havoc. The rain fell the heaviest over the inland parts with Murrurundi recording more then 225mm in a 24 hour period. Rainfall in the western catchments of the Hunter were also very high with Merriwa recording 264mm in the 24 hour period. The coastal areas received about half the amount of that of inland. Williamtown recorded less then 100mm in the 24 hour period. Rainfall isohyets (in mm) for the “Hunter flood” event of February 1955. Image courtesy of the Bureau of Meteorology. Even in the heavy rain the temperatures where around 26°C with dew point temperatures around 25°C. These types of conditions are rare in these southern latitudes and a more common in the northern latitudes from the Queensland border. Since the ground was already wet due to the above average rainfall for nearly 6 months leading to the floods, the runoff from the heavy rain on the 22nd was exceptionally high in the catchments of the Goulburn, Pages and the Hunter River. The Hunter River swelled to record heights in Singleton with the river breaking its banks into the township. The water continued to flow down stream and it eventually hit Maitland on the 23rd. The Hunter River in Maitland peaked at 12.3m on the morning of the 24th, breaking its previous record height by nearly 1 metre. More then 35,000 people where evacuated, most of them from the Maitland area. The Hunter River broke its banks and water spilled into the main CBD of Maitland and into Lorn. The main streets of Maitland became creeks of rapidly flowing water, damaging homes and businesses. Debris made up of buildings, trees, dead livestock, motor vehicles and silt collided with obstructions, smashing shop front windows, fences and some homes. The farmlands surrounding Maitland where transformed into a murky lake. The Hunter River, with help from extra runoff coming from the Paterson and Williams Rivers, broke its banks along Raymond Terrace and Hexham. The main transport route from Maitland to Newcastle was cut off. This Navy chopper plunged into the water a few moments after this photo was taken. Rescue was assisted by boats, motor vehicles, planes and helicopters. 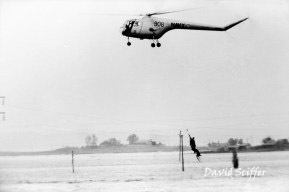 The Royal Australian Nay (RAN) used several choppers as part of the rescue. Images that appeared in newspapers of a RAN chopper trying to rescue a man in the floodwaters shocked the nation. The chopper was rescuing a man on a harness when it collided with power lines. The chopper fell into the murky flood waters below, claiming the life of the man who was being rescue. The total area of New South Wales that was under water due to flooding was nearly the size of the United Kingdom or 2 times the size of Tasmania. The flood waters remained in the low lying areas for over a week but generally the water resided a few days later. Twenty five lives were lost and a total of 7000 buildings and homes were damaged in the Maitland/Singleton area. 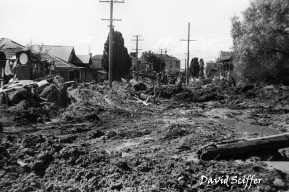 Fifty eight homes were destroyed in Maitland. Livestock losses were as much as 100,000. The total cost of the flood in today’s currency, was approximately $1.3 Billion. The clean up took many months. Mud and debris as high as 4 foot deep was dumped on the streets. As time went on businesses reopened and homes were either demolished or repaired. A damaged house with a truck amongst the debris. Debris and mud line the streets after the flood. The floods re-altered the course of the Hunter River in some places. The flood system of the Hunter River was mitigated. As part of the mitigation that took place, levy banks and flood channels were constructed. A flood of this magnitude has not occurred since in the Maitland area. 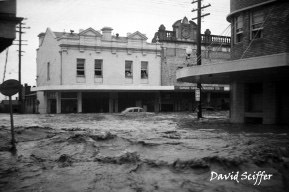 The largest flood to hit the Maitland area since 1955 was the flood of March 1977 where the flood height peaked at approximately 11m. The monthly rainfall totals for February 1955 still stand as the highest on record for February in a large area of the Upper Hunter and the surrounding districts.